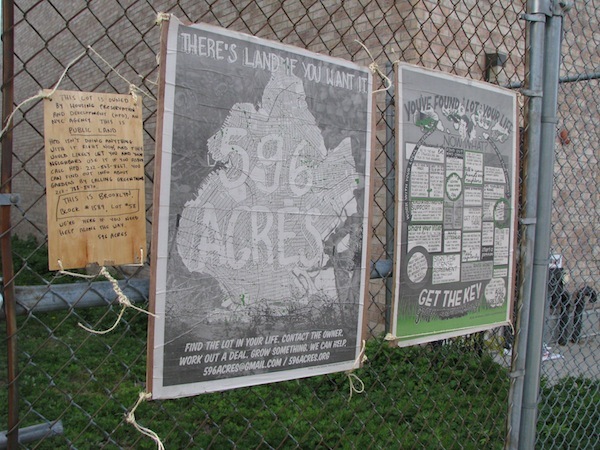 596 Acres distributes information about publicly owned vacant land in Brooklyn by publishing print maps, creating and hosting an interactive map, holding land use visioning sessions, and providing advocacy and support for community-based groups all over Brooklyn as they negotiate with city agencies for permission to use currently vacant and fenced-off lots for community-determined projects. Since we tested our tactics in a pilot project in June 2011, three vacant and warehoused lots in Brooklyn have become official sites of community projects: 462 Halsey Street, Feedback Farms, and the Java Street Garden Collaborative; Myrtle Village Green and Patchen Community Square are nearly official, too. 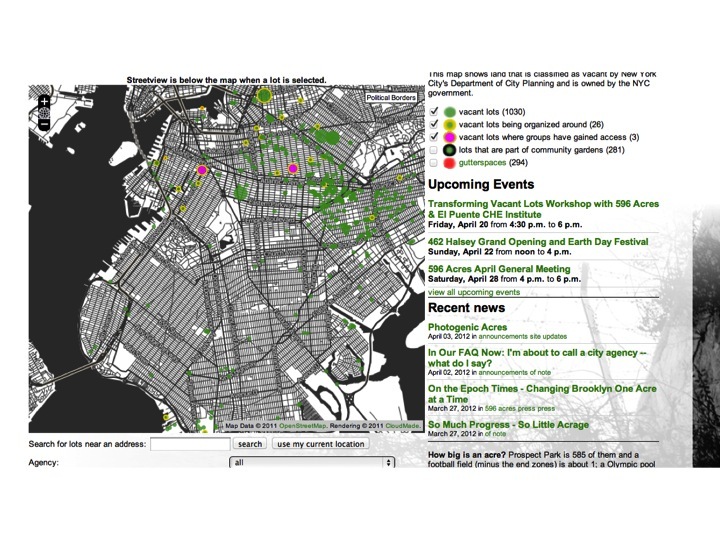 Twenty-seven other communities are organizing for control of different pieces of Brooklyn using our tools. The April 2012 Awesome Foundation grant will be used to fund a dramatic extension to our current project by adding the publicly owned vacant lots in the other four boroughs to our site. This will give the communities in the rest of the city an idea of which vacant lots are owned by the city. It’s extra Awesome that this part of our project is funded now because without the map and data, we couldn’t make sense of vacant land in the other boroughs. The grant from Awesome will pay our hard-working programmer – who has been doing all work for 596 Acres for free for a year – to expand the online map’s capacity to handle data for the other boroughs. It will let our interactive map go ALL CITY. It’s hard to find funding for web development. It’s awesome that we have! Simultaneously with expanding our online tool’s scope, we will gather the data for the rest of the city, create print for each borough, print them, distribute them in Visioning Sessions and post them on fenced lots as we have done in Brooklyn in collaboration with community-based organizations in the other boroughs. The whole ALL CITY ACRES pilot project has a budget of $6500. The Awesome Foundation New York has given 596 Acres another $3,000 towards the ALL CITY ACRES project’s physical manifestation. We are raising the rest of the money (for design, and printing and sign-making materials) by asking folks to contribute to our project on IOBY.org. Please do – even $10 will go a long way!